They’re already on volume 68 of the Underground Hustlin’ mixtape series and our homie Young Wicked is hostin’ this one. If you’re an Underground artist with some mad skills that wants to showcase your talent to a wider audience; Underground Hustlin’, muthafacko. Check out the video of Mr. Wicked himself addressing the contest below. 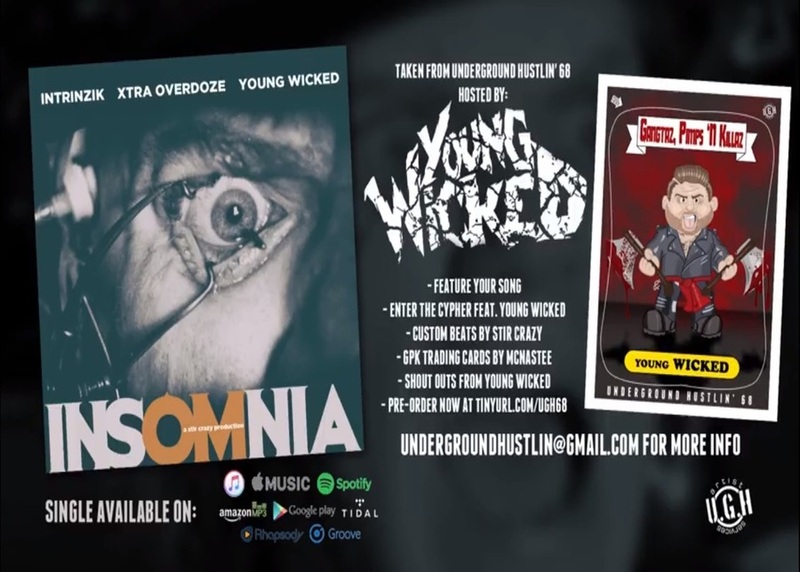 Also stick around on that video and check out the new single “Insomnia” by Intrinzik, Xtra Overdoze & Young Wicked taken from the new mixtape. You can also download the track on iTunes by CLICKING HERE or check that out on Spotify by CLICKING HERE. At least you don’t have to pay to be on this one, unlike that other con artist a week or so ago. It’s a business, money switches hands for everything dude. A buddy of mine ponied up $70 for that, no problem. Those who are chasing the dream understand what it takes; stuff isn’t free. Actually Karacalla, UGH is a “pay to play” compilation. They may be giving away a freebie, but almost every track on all of these albums was paid for by the artist.